FINALLY! After years of procrastination, being bogged down in school, and many other life events getting in my way, I have finally something to post. A completed Zephyr Glitch list. Yes, I know I listed some of these glitches before it was complete. But I wanted to re-post it in its entirety with the new glitches I wrote for it as well, so as to not have to dig through the pile of comments to see the glitches. But here it is, after many years of waiting fans! The Zephyr Glitches of the guide! Note: Requires the Double-Jump Technique. This is a technique that will allow Spyro to get to the end of the level (just outside of the area with Corporal Glug, the guy who gives you the “Ruby Bomb” Talisman) without having to access the use any of the doors in Zephyr. Okay, first enter the level Zephyr. First, go through the level normally until you reach Sergeant Tub (or the guy who’s using the cannon to try and kill the bird). Now, instead of using the cannon to get through the door, jump onto the platform directly to your right, and then turn around. (This should be the area in the level where the second set of birds flying around will attempt to dive bomb Spyro.) 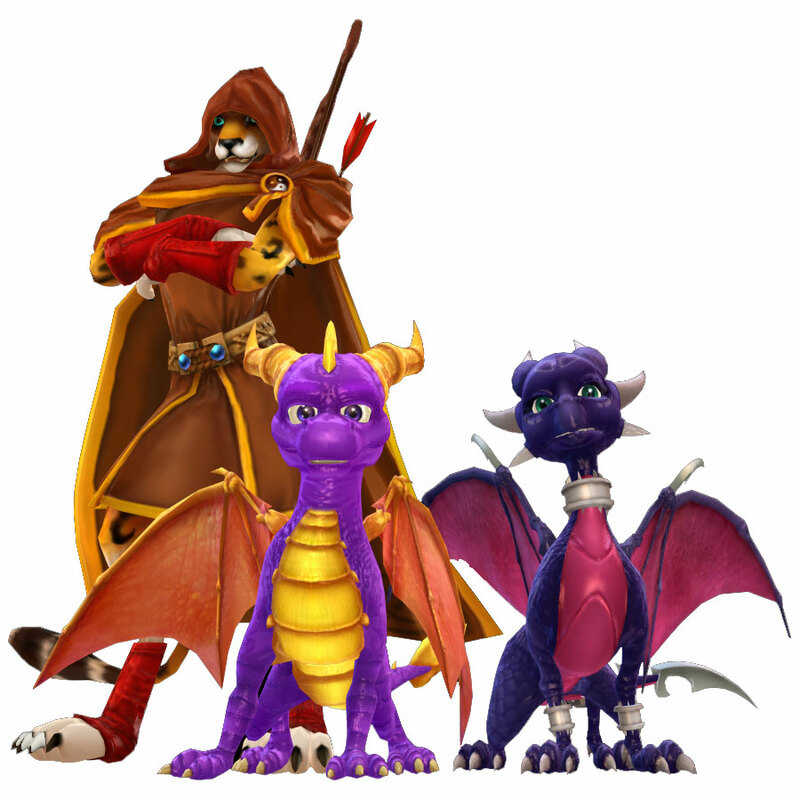 Next, position Spyro so that he is directly parallel to the “tower” to your right. (This is the “tower” facing the platform where the metal case of gems are/were, and is the shortest one of the two “towers), and simply Double Jump, glide, and hover (if need be) to get on top. Finally, Double Jump and glide, or just simply glide and hover (if need be) toward the platform directly in front of you (the one that has/had the metal gem chest). Now, the next step to this glitch is a little bit tricky. Position Spyro so that he is facing the green-like wall directly to the left of the castle-like doorframe. Next, edge Spyro so that he is as close to the edge as possible (without falling off) facing the wall. Then, Double-Jump, Glide, and hover (if need be) toward the wall. (When doing this, try to aim directly for the top-most section of the wall.). If done right, you should have been able to glide right through the top part of the wall. Now, while gliding, try and land in the hallway with the birds with the TNT. (If you miss the hallway completely, though, when going through the wall, you can instead try and land in the area where the Cowlek Challenge was instead, then use the whirlwind to get back to the area where Zoe zaps you for a second time.) You have now skipped the first door in Zephyr! Continue walking through this hallway until you reach the area where Zoe zaps you a second time. Once you are here, go to the right of this platform away from Zoe until you reach another castle-like wall (or the boundary wall for this platform that appears unreachable). Position Spyro like before so that he is directly parallel to this particular wall, and Double Jump onto one of the lower sections of this wall. (This may take a few tries to do.) From here, have Spyro jump and glide toward the green-like hills directly in front of you. Simply walk forward along these hills until you are past the second door. Finally, simply glide back down to the level. Ta da! You have now successfully skipped most of the doors in Zephyr. Okay, first start out at the beginning of the level. Then, go to the area where you encounter the first set of “towers” to your right. (This area should be a little bit behind the hill that you use to destroy the first set of birds that provide ammunition for the birds on the ground. This is also the spot where the birds flying around in a circle will try and dive-bomb you when you stand on top of the hill.) Now, jump up on the platform to your left (in order to go behind these set of “towers”), turn around, and jump onto a little ledge between these two “towers”. You should now be between these first set of “towers”. Then, position Spyro so that he is directly parallel to the lowest “tower” to your right, and Double Jump while also moving in the direction toward the “tower”. If done right, you should be able to get on top of this hexagonal “tower”. Now, simply Double Jump and Glide, or Glide and Hover to the tallest “tower” directly in front of you. (This one should be octagonal shaped.) Once you are here, glide to the next smaller “tower” directly ahead of you. Now for the tricky part. Position Spyro so that he is facing the boundary wall directly ahead of you. Finally, Double Jump and glide directly to the right hand side of the boundary wall. (Try and aim for the slanted section in the wall directly to the right of you.) If done right, you should now be able to walk atop some of the hills of Zephyr. 85.) Who Are You Aiming For? Note: Requires the Super Flame. This is another minor “bug”/glitch that will happen to you when you flame the bird Sergeant Tub is aiming for. Okay, first follow glitch #81 up to the point where you are at the part with the cannon. Now, before you do this, make sure you don’t talk to Sergeant Tub otherwise the “bug”/glitch won’t work. In order to perform this “bug”/glitch, simply flame the bird that Sergeant Tub is aiming for with your Super Flame breath, and there you go. Sergeant Tub will sometimes continue firing at the “bird” you just killed. Kind of weird, huh? Note: Requires the Double-Jump Technique, and part of the previous glitch (glitch #81). This glitch is one of those minor bugs in the game that will allow you to get behind the wooden door where you could get some gems (behind the cannon). Okay, first perform the previous glitch (glitch #81) up to the point where you are on top of the lowest “tower”. Now, instead of jumping to that platform where the unbreakable chest is/was, turn around until you see the higher “tower” directly above you. To get on top of this higher hexagonal “tower”, simply Double Jump and Glide, or simply Glide (and hover, if need be) over to it. Finally, both Double Jump and Glide again, or just simply jump and glide, through the green hill directly ahead of you. You should have been able to go through it. Now, while gliding, it is important to try and land inside of the room directly to your left. Once your inside, congratulations! You have successfully gotten behind one of the doors in Zephyr. To undo this glitch, simply walk forward through the blank doorway, and you should be able to pass right through it. Note: Requires going to a spot described in Glitch #83, and the Double-Jump Technique. Once here, Double Jump up to the top of the level onto the castle like boundary wall, like I described in Glitch #83. Now, instead of going back into the level, carefully turn around. You should now be able to see the area with the “Romeo and Juliet” challenge. Now, position Spyro so that he is directly perpendicular to the spot where Juliet is standing. Now for the hard part. Edge Spyro as close as he can to the edge of the boundary wall, and simply Double Jump and glide toward the Juliet platform, and hover at the last minute. If you did it right, you should land right next to Juliet. Talk to her, and she’ll give you the orb for “rescuing her”. Ta da! You have now successfully skipped all of the “Romeo and Juliet” challenge by simply doing a jump! By effectively doing Glitch #87, another glitch rears its head up. By glitching your way to Juliet and talking to her, you effectively collected the, “Sowing Seeds II Orb” first. When this happens, the game thinks you have collected both orbs, and thus does not allow you to collect the, “Sowing Seeds I Orb,” regardless if you have completed it or not. While this can be annoying, you can simply recollect the missing orb by simply exiting the level, and then re-entering it. Doing this resets every mission in the level, allowing you to collect the, “Sowing Seeds I Orb”. Note: Requires Super Flame powerup, if you want the glitch to be much easier to pull it off. A minor glitch that can be a little bit entertaining, once you pull it off. All you have to do is go into Zephyr and do either one of the, “Cowlek Corral,” orbs. When you are flaming the Cowleks into the corral, something strangely funny can occur. Whenever the Cowleks are in the corral, they will walk around randomly. However, when they walk around, some of the time, they will group together. This is the moment where the Cowlek you are working on getting into the pen should be flamed in their direction. When doing this, the Cowlek will fly towards the group of Cowleks and get bounced off by their collision. It looks pretty funny. However, if you aimed just right, they can sometimes even get stuck in the air, even if for a brief moment. Whenever the Cowleks decide to move away from each other, their collision that was keeping the Cowlek you flamed in the air will move with them, causing the Cowlek to finally fall into the pen. This glitch requires you to complete the, “Walking On Hills Of Zephyr,” glitch completely. After you have completed this, make your way to the boundary walls of Zephyr towards the end area where Corporal Glug gives you the Ruby Bomb Talisman. Once you are close enough to the end area, the birds that drop bombs on you will proceed to try and attack Spyro. The problem is, Spyro is out of bounds. This causes them to get stuck on the boundary wall of the level. They’ll be stuck in what appears to be a catatonic state. (Basically, they’re stuck in the last frame of their attack animation.) Using Spyro’s Headbash ability while standing still out of bounds while the enemies are stuck in this state will cause the birds to start to descend straight down, for some odd reason. When you stop Headbashing, they will ascend back to the point where they first targeted you. The enemies can get out of this state two ways. The first is by you killing them, obviously. The second is if you get too close to them, or get back in bounds, they’ll get out of their catatonic state and attack you as they normally would when you were in bounds. Important: This is a trick that works only on specific copys of the game. I believe it only works on the PAL version of the game (European Version). Note: Requires nothing but killing enemies! This is a “glitch”/bug in the game that allows you to have defeated one extra enemy in Zephyr than the original number of enemies stated on the pause menu. Okay, to perform this “glitch”/bug, simply defeat all of the enemies in the area. That’s it! Now, once that is done, simply pause the game and look at your enemy counter. If done right, it should say that Spyro has defeated 30/29 enemies in the level Zephyr. This glitch will allow you to re-watch the Romeo and Juliet cutscene again, but in a somewhat glitched out state. To start the glitch, simply complete Glitch #87 in the guide. After you have done that, make sure to kill Spyro in some way. Do not let Zoe zap you before you kill yourself, as the glitch will not work. After Spyro has lost a life, you will spawn back on the ledge where you got the Orb from Juliet. From here, simply talk to Juliet again. Doing this will cause a glitched out version of the cutscene where Juliet flies back down to Romeo to play, despite having already played when you obtained the orb. WOOH!! Thank you for the Zephyr glitches! Are you going to do a guide for Year of The Dragon? I was planning on trying to do that project once get that far. But after I finish this Glitch Guide first. Life has been keeping me preoccupied lately, with a job and going to college. So the reason I haven't updated this in a while is due to a fEw reasons. Mainly my computer I originally worked on for this Glitch Guide finally got to that certain age where it just doesn't want to work anymore. Considering I got 10 years out of it, I'm not surprised. (I'm having to type this update from my phone, for Pete's Sake.) I still backed up everything I really cared about from my laptop long before it died. That's including this Glitch Guide. So don't worry about content missing. I'm getting a new laptop sometime this December 2018. So work can finally continue on it. At least during my freetime between my real life job and leisure time. I swear when I started this Guide I didn't intend on myself taking this long to finish it. Sorry for the wait, but I'm hopefully going to get back to finishing this project of mine. Especially since the Reignited Trilogy got me back in the spirit of Glitch Hunting and playing Spyro 2 again. Woah hello! I'm glad you and the Glitch Guide still exist!